Arnebia Eucroma Extract, Damask Rose Oil, Bees Wax. Treatment of all kind of wounds and scar prevention. Clinical results show that Haluma ointment reduces inflation, accelerates the natural process of healing and has scar prevention effects on the wounds. According to studies, the active ingredients in the formulation of this ointment, such as the various forms of alkaline, and shikonin and flavonoids, have anti-inflammatory, antioxidant, anti-fungal, and antibacterial properties that have a significant impact on wound healing. 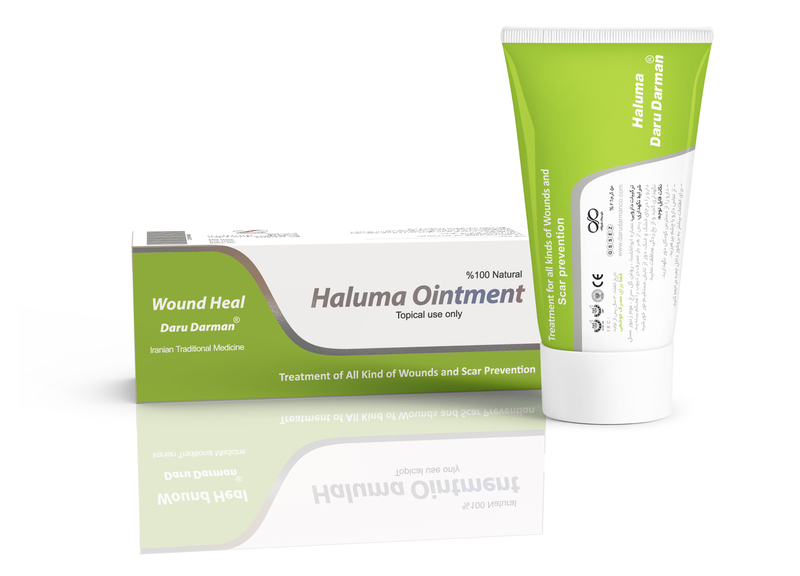 Haluma ointment directly interferes with wound healing and provides the environment for tissue growth. By increasing the viscosity of the wound, it prevents bacterial growth on the wound and prevents the formation of scar tissue. Damask Rose Oil is known for its ability to relieve skin irritation. Essential fatty acids help improve the appearance of ulcers and skin spots. They also can induce skin regeneration, which helps to grow new skin and repair skin problems. Damask Rose Oil is the natural source of omega-3, 6, and 9 fatty acids that helps repair damaged skin while reducing the pain of the wounds. As a moisturizer, essential fatty acids improve the flexibility and permeability of the skin. All ointment may have unwanted side effects. Although all these side effects are not likely to be seen in every one. You must consult with a physician or a pharmacist in case any allergies or irritations arise. So far no side effect has been reported. Initial cleaning of the wound area with normal saline serum is advised. Cover the wound with enough ointment. Open the dressing after 24 hours and repeat the above-mentioned processes. Continue this process once every 24 hours until the wound is completely healed. In the case of prevention of scar, a thin layer of ointment should be in constant contact with the position (once or twice in the ointment).